Today I'm sharing a post that I'm pretty excited about. It's been a while since I've done a true comparison post and they're always fun for me to do! :) And I've heard from readers that they're fun to look at from your end too, so it's a win-win for everyone! Today's competitors are both from the same parent company so it makes sense that people would wonder if they were the same polish re-bottled and re-branded... Well, I think I can give you a confident answer to that question, so keep reading below to find out! 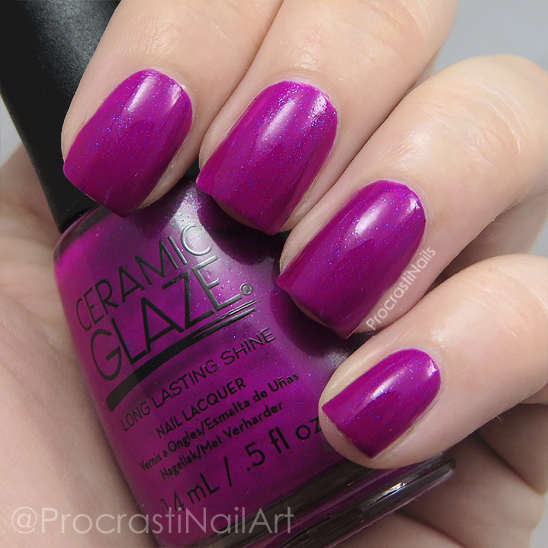 The first polish we're looking at is Ceramic Glaze Impulsive which is from the 2016 LE Botanical Oasis Collection. 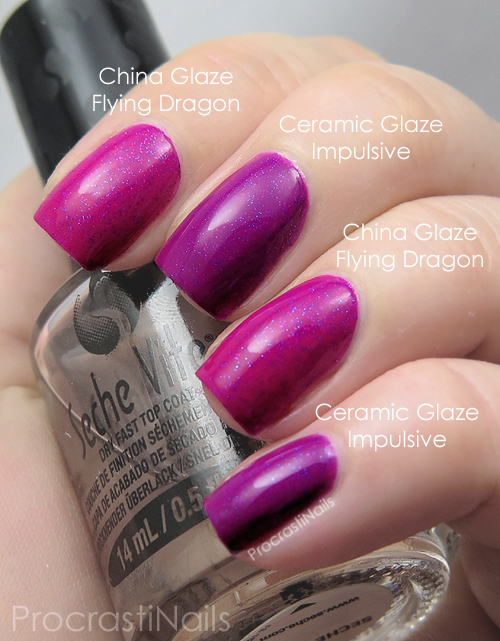 As soon as I posted these swatches on instagram I got a handful of comments saying "This looks like Flying Dragon!" which is what prompted this post. And I can definitely see where that thought comes from! 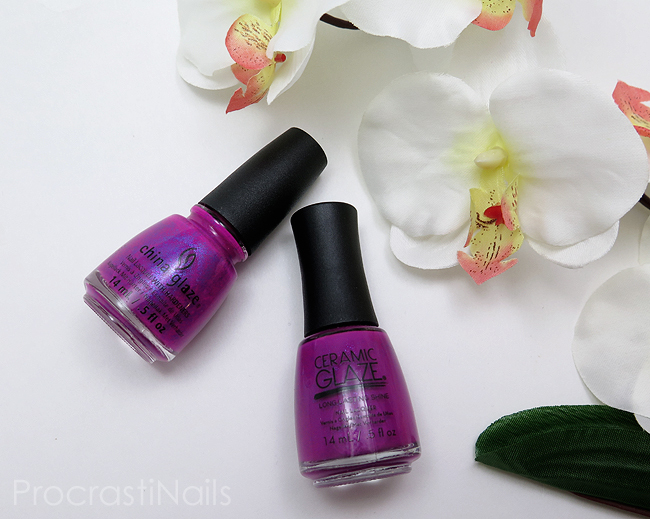 Both are bright and bold electric violet cremes that dry matte but gloss up gorgeously with top coat. As you can see below Impulsive is packed with blue and pinkish-purple microglitter. Is it the same as our competitor polish? Hmm! We'll have to see! So let's get to the actual comparison, the thing you're all here to see! 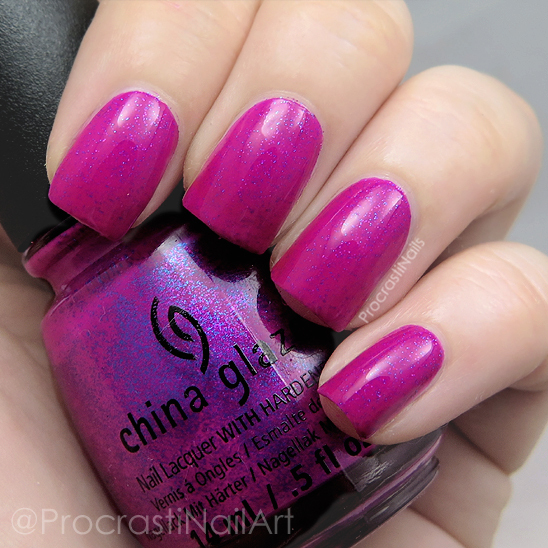 China Glaze Flying Dragon is applied on my pointer and ring fingers, and Ceramic Glaze Impulsive is on my middle and pinky fingers. It would seem like this is a cut-and-paste case of different polishes seeming similar, right? Wrong! 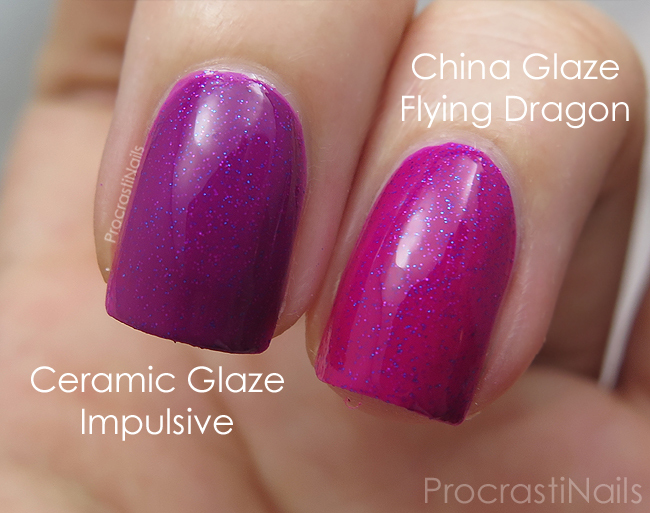 Turns out there are two different formulas for China Glaze Flying Dragon! One is more pink-leaning (aka the one I have) but there is also another version that is darker purple. What! 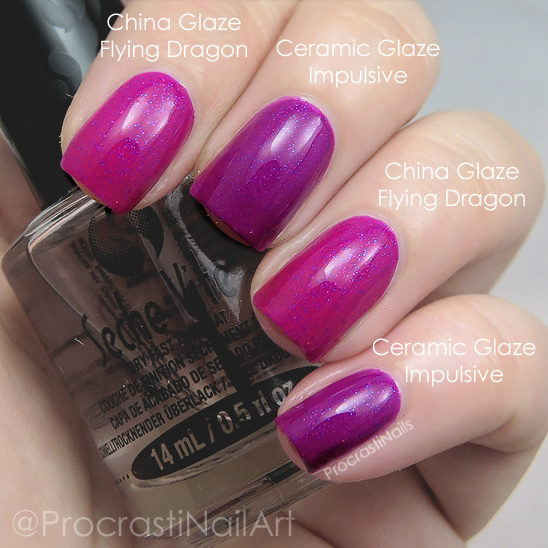 So what I will say is that Impulsive is not a dupe for my bottle of Flying Dragon, of that I am certain. But the second (darker) formula is a whole other question (and a whole other post potentially, if I can get my hands on a bottle of it). From what I've seen the darker FD is a true purple so while it's possible it could be a dupe for Impulsive it's more likely that Impulsive shade sits right between the other two on the pink/purple spectrum. So what do you think? Is this the outcome you predicted, or did you think they would be true dupes? Let me know! Great comparison post of the two shades. They look pretty similar but there definitely not dupes of one another. They didn't look the same in the bottle to me BUT I thought from the bottle shot I'd like the China Glaze better, on the nail I definitely liked the Ceramic Glaze! This is why comparisons or at least swatches are needed! If I had just been passing by these in the store, I would have thought they were the same and only bought one, but now I need both! Lol, yep, you need both, because I can't choose ;) Do I want more pink or more violet? I want both! Great comparison, more posts like this are needed. Thank you for sharing! I thought they were going to turn out to be dupes, but they clearly aren't. Thanks for doing this comparison. I like these types of posts! Great comparison! I used to do these, I need to get back into it. I forget how helpful they are.